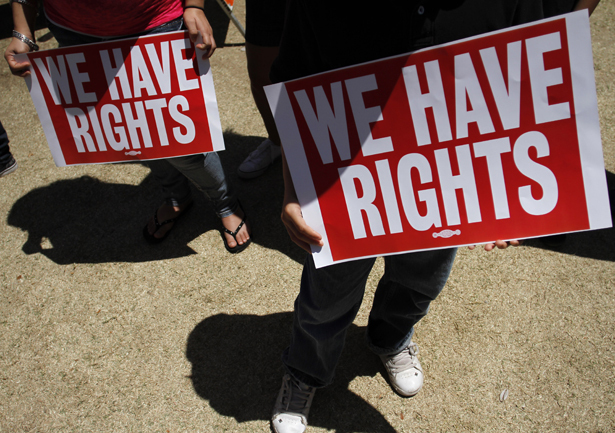 Why are so many grassroots immigrants rights groups opposing the legislation? Senator Chuck Schumer’s gamble that his fellow lawmakers would pass an immigration bill out of their chamber by the Fourth of July proved fruitful. The bill is now headed to the House—although it might not be, because that chamber isn’t entirely sure it even wants to debate it. But in the frenzy surrounding what’s been called a historic move, a lot has been lost around what the bill has actually become, and why so few voices on the left have accepted the bargain. Just a few days before the bill’s passage, a coalition of immigrants rights and environmental advocacy groups made a big announcement in Tucson, Arizona, in opposition. Their reasons? The so-called comprehensive immigration bill is less comprehensive than it is punitive—doubling border agents to nearly 40,000, while adding more than 300 extra miles of fencing on the southern border, all in addition to billions of dollars for drones. Vallet was correct when stating that the move for the tougher enforcement amendment did draw some Republican votes. But her plea to stand in real solidarity with immigrants has gone largely unnoticed from mainstream groups. With the notable exception of Presente.org, which told The New York Times it could not conscionably support a bill that’s “guaranteed to increase deaths,” most groups with a national reach have remained silent—if not in full support of the bill. The argument, of course, is that agreeing to increased spending, enforcement, fencing and surveillance will mean that 11 million undocumented immigrants will become naturalized at some point in the future. In reality, however, that’s simply not true. In fact, the number is somewhere around 5.7 million undocumented people who will apply for and attain green cards*. By 2028. That’s because, aside from enforcement, the bill is crafted in such a way to ensure that the most vulnerable undocumented immigrants will be unable to jump trough the many hoops placed in their path. The idea that additional drones—maybe even armed drones—at the southern border, along with a doubling of border patrol agents, and hundreds of miles of fencing will mean citizenship anytime soon for 11 million members of society is false. The bill may mean a lot more spending and enforcement, in exchange for less than six million people, who won’t even have a chance at citizenship for quite a long time. *An earlier version of this post erroneously noted that 5.7 currently undocumented immigrants will be green card–eligible; it's been corrected to reflect that 5.7 will apply for and get that status. Read No More Deaths volunteers Catherine Gaffney and Kate Morgan Olsen’s take on the impact increased border militarization will have on immigrants.